When I went to visit my Mom last week, she had two more quilt tops ready for me to take home. I like her colourful scrap nine-patch quilts. This top measures 51″ by 72″. I used a green striped backing and quilted it with the Circle Lord Swirlz pattern. This is number eight of the eleven quilts my mother is making as eventual wedding gifts for her grandchildren. Even though there is no rush to have them complete, I prefer to get them done. My mother will be visiting here at Christmas and I expect she will bring me the final two quilt tops. I feel a great sense of satisfaction when a project is done, so getting these done now feels good. Goal Status: 35 quilt projects complete and 17 more to go by New Year’s Eve! 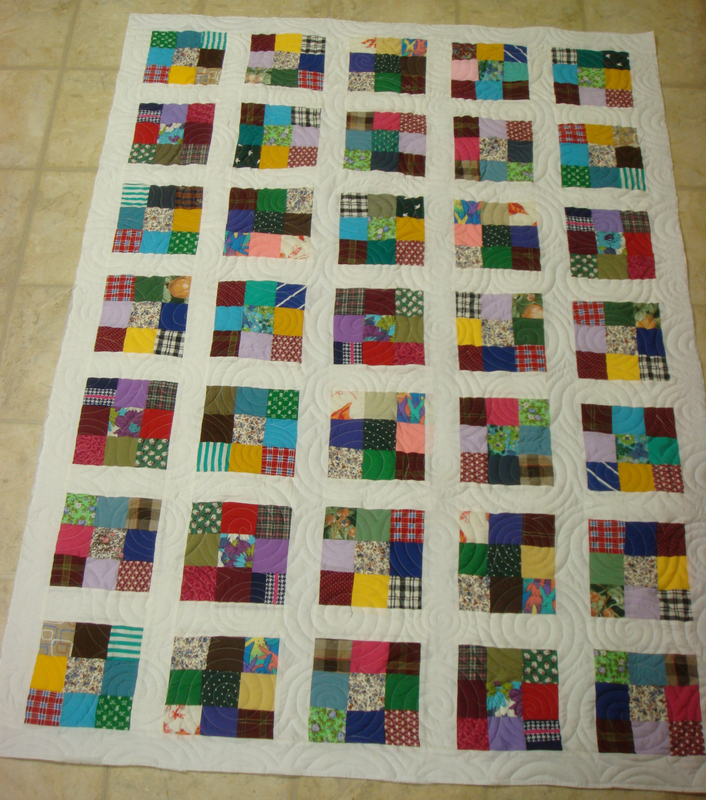 I still feel confident that I will reach my goal of 52 completed quilt projects during the year 2011. This entry was posted in Completed Quilt Project and tagged Lap Quilt, Nine Patch, Scrap Quilt, Simple Quilt, Wedding Quilt. Bookmark the permalink.